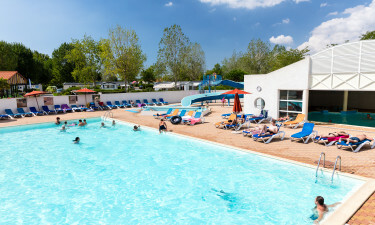 Open from 14th May to 10th September, the family friendly LUX-camp Le Jard in France's lovely Vendée region is a great place to rent a mobile home for a relaxing camping holiday with family and friends. Boasting 350 pitches that offer seclusion and privacy, this holiday camping site is a perfect base from which to explore historic towns and villages, tourist attractions and nearby La Grière beach. What are you waiting for? The team at LUX-camp Le Jard is looking forward to welcome you! Le Jard features its own supermarket, although campers should have no difficulties obtaining freshly baked bread and other groceries nearby. This is the La Grière area of popular resort La Tranche-sur-Mer and there are plenty of shops around in a 1.5 mile radius of Le Jard Lux-camp. Camping luxury should include not having to cook every day! 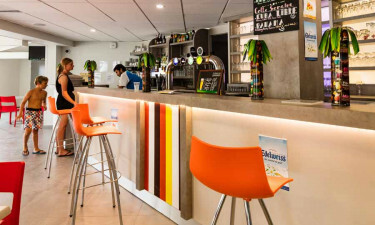 At Le Jard guests can enjoy meals at the site's own restaurant and relax at the bar with a drink. The luxury camping site is just 27 miles from the town of Les Sables d'Olonne, 38 miles from La Rochelle's designer shops, nightlife and beach attractions and within 62 miles of the attractions of Puy du Fou. Onsite amenities and leisure activities include tennis courts, play areas for children, outdoor and indoor swimming pools and water slides, bike hire, and all the water-based sports beach babes can wish for, from surfing to sailing, swimming and snorkelling to merely sunbathing and snoozing on a shaded sun bed. Evening entertainments are available for adults during summer, as well as activities for little campers during the day. The Vendée region boasts many attractions for an unforgettable camping holiday on the French coast. Where to start? Try the the ancient village of Nieul-sur-l'Autise, where Eleanor of Aquitaine was allegedly born, or the place where Richard I of England (the Lionheart) had his base at Talmont, then perhaps you'd like to go on boat tours exploring the lovely towns that lie along the Vendée River, or hiring a car to explore the 120 mile long Atlantic coastline comprising of mostly sandy beaches, pine forests and sand dunes for nature lovers. Or maybe the museums, abbeys and churches, historic mills and other landmark buildings will excite your sightseer's appetite? At luxury camping site Le Jard all this is within your grasp!